Surfing & Yoga on the Water? Sounds fishy to me. What do you get when you combine a love for water, the outdoors and a yogi? SUP Yoga, of course. It’s what’s happening these days. I’m here to tell you more about why you should try SUP Yoga! 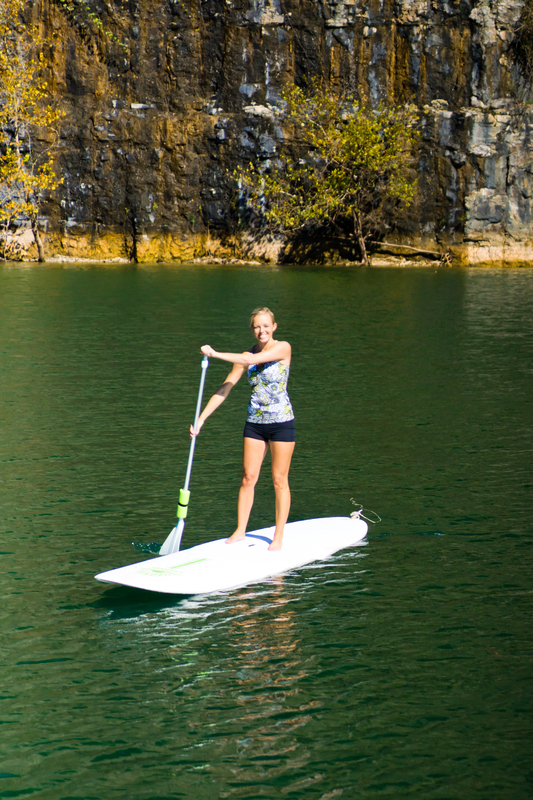 Paddle boarding is a sport that allows you to have fun on the lake, get a great workout in and get a tan! What more could you want? Paddle Board’s are large surfboard’s, they are stable and can double as a yoga mat should you desire to break out your downward facing dog. You are able to stand up, sit down, lie down and even paddle on your knees. The possibilities are endless! You’re thinking what if I fall in, I have no balance? The good news is that your body is already good at balancing and you will surprise yourself at how good you will be. I promise! But you know what? What if you do fall in? Trust me on hot days you’ll be jumping in! That’s part of the fun. And guess what? The board’s stable enough that you can climb right back on with minimal effort. Think about pulling yourself out of the pool. It’s basically the same thing. It’s therapeutic, it’s outdoors, you can’t beat the scenery, and it’s just plain fun by yourself or with a group. Does it sound like I’m trying to make a sale yet? That’s because I am! It won me over on day one. Try it! You won’t regret it. SUP Yoga, is you guessed it, yoga on a paddle board. Yoga is a little more challenging on the paddle board but that’s part of the fun! I do recommend you take a paddle board lesson before you take a SUP Yoga class. You’ll be more confident on the board and get more out of the experience. 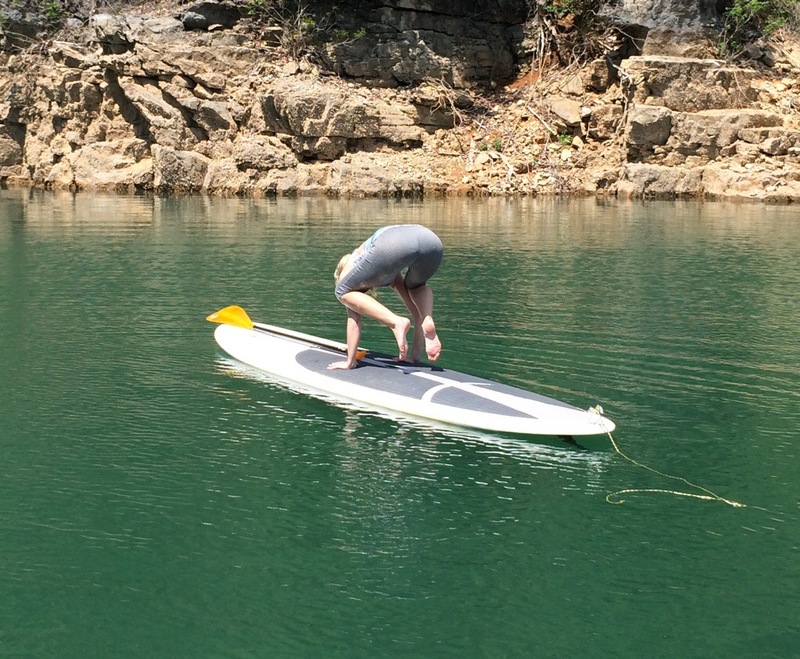 So maybe you are new to yoga and you’re wondering if SUP Yoga is something you should try? My answer is absolutely! After an intro paddle board class, and a couple of yoga classes, sign up for a SUP Yoga class! We do basic yoga poses and if you want to try a balancing pose or a headstand, I’m not going to stop you :). You always have the option of child’s pose or tanning on your board. Did I mention Savasana? Savasana will have new meaning after your SUP Yoga class, relaxing in the warm sun, sounds of nature that sing in the background, the gentle breeze that brushes over you and makes you feel like you’re a million miles away from reality. Yeah, it’s that good! 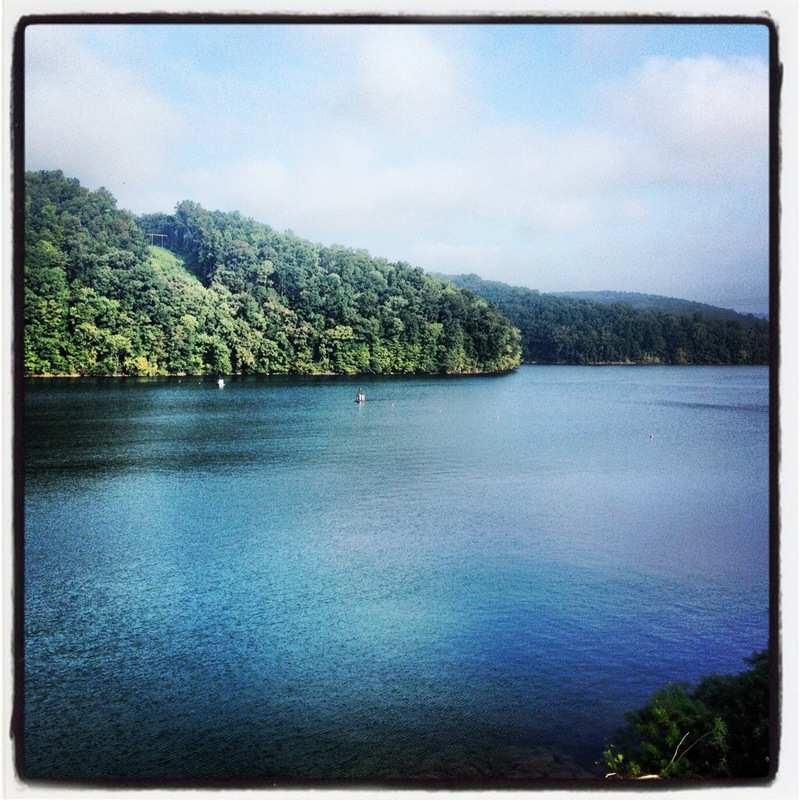 This entry was posted in Yoga and tagged sup, supyoga, yoga. It’s April and I’ve been dreaming of warm sunny days, beautiful blue skies and paddle boarding all winter! Paddle Boarding has been very therapeutic for me physically and mentally. It’s also another platform and an opportunity for me to share yoga. Paddle boarding is quickly becoming a favorite past time as evident on lakes, rivers and oceans. You see them everywhere and if you haven’t, you will. The beauty of Paddle Boarding is that its benefits far outweigh the fear of trying it. Typically paddle boards are larger than surf boards, meaning they are more stable and can double as a yoga mat. You are able to stand up, sit down, lie down and even paddle on your knees with some practice. Your body is already good at balancing and you will surprise yourself at how good you will be. I promise! You want more good news? It’s an amazing workout that doesn’t feel like a workout! More benefits? It’s therapeutic, it’s outdoors, can’t beat the scenery, and you get that natural sun kissed glow (underneath that sunscreen, of course!) and it’s just plain fun by yourself or with a group. Yoga on the paddle board is a little more challenging but that’s part of the fun! I do recommend you take a paddle board lesson before you take a SUP Yoga class. Simply because it will be more enjoyable when you know the basics of how to turn and paddle correctly. So maybe you are new to yoga and you’re wondering if SUP Yoga is something you should try. My answer is absolutely! After an intro paddle board class, and a couple of yoga classes, sign up for a SUP Yoga class! We start with basic poses and slowly work up to more challenging ones. And as in Yoga class you always, always have the option of child’s pose. If you’re more advanced this also provides you an opportunity to challenge your practice. Did I mention Savasana, the final pose in yoga? Savasana will have new meaning after your SUP Yoga class, relaxing in the warm sun, sounds of nature that sing in the background, the gentle breeze that brushes over you and makes you feel like you’re a million miles away from reality. Yeah, it’s that good! Initially, I was drawn to paddle boarding because it was a new adventure, a new challenge but it’s given me so much more. As I said, paddle boarding has been very therapeutic for me. It helped me rehabilitate my elbow after a bad break last year. It offered me a place to meditate and clear space in my head. A place for my thoughts to be still and appreciate what I had around me. You see the past few years I had been in a downward spiral maybe from bad choices or bad luck it didn’t really matter. I was feeling hopeless but I was still trying. So at the same time I was trying this new adventure and learning how to balance on the water I was also learning how to find my balance in life. I was letting go of the past, and finding my purpose. So that’s why I am so passionate about yoga and about paddle boarding. I’ve been teaching yoga for years and to combine my love of yoga and water, well, it’s simply perfect for me. They have brought so much good into my life. I know you’re thinking, “Wow,” if a paddle board and yoga can do all that?! Sign me up!” I don’t know what they can do for you but neither do you unless you try. I do know you can have a heck of a lot of fun finding out and trying something new! So yes, sign up! Try a yoga class, or paddle boarding, something that motivates you! Step out of your comfort zone and see what happens. I can promise you won’t be disappointed for trying a new adventure no matter what it is. And like me, it just might be the one thing that awakens your soul that gives you a place to create space in your own life for good things. So where can you try Paddle Boarding, SUP Yoga or both? Well you’re in luck, I happen to know a great place to recommend and I also teach SUP Yoga there! Check out my friend, John Marquis, owner of Norris Paddling Adventures. He taught me to paddle board! He also has a ton of options for family fun! Check out his website or go like his Facebook page to stay up-to-date on all the happenings at Norris Paddling Adventures. And if you’re interested in taking a Yoga class with me, let me know. My name is Amber Boone and I teach at a few locations in Knoxville/Powell. So come check out a beginner class on land or soon on water! This entry was posted in Yoga and tagged outdoor yoga, sup, supyoga, yoga, yogaforbeginners, yogaposes.